HABITAT Mainly littoral, occupying rocky coastal areas, secluded bays and inlets near river estuaries. Studied on the north end of Chiloe Island, Chile, in an area characterized by a rocky shore of irregular topography with a heavy swell and a constant strong northeasterly, westerly or southwesterly winds, a tidal range of 2.0 to 2.5m, and a dense cover of shrubs and small trees stunted by wind and poor soil extending down to the high-water mark. Below this there is a heavy growth of seaweed and algae. GEOGRAPHICAL SPREAD Ranges from Chimbote, central Peru, in the north to Cape Horn and the Estrecho de le Maire (Strait of Le Maire) in the south of Chile. It is possible that the species still occurs near Isla de los Estados (Staten Island) off the southern tip of Argentina. CURRENT POPULATION No estimate is presently available, although the species has become extinct over much of its range, and elsewhere exists in much reduced numbers. SIZE Total length 87 to 115cm. NORMAL DIET Shellfish form the greatest part of its diet, although fish and freshwater prawns are also taken. NORMAL LIFESTYLE The Marine Otter is considered timid and secretive. The species is principally diurnal, although it can also be active at dusk and dawn. Evidence for territoriality is inconclusive; fights have been observed between adult otters. Pairs of otters have been seen fishing cooperatively and sharing the large fish caught (Reeves, et al., 1992). Breeding at Chiloe Island occurs in the summer with matings observed from December to January. Gestation period lasts somewhere between 60 and 120 days with young born in autumn and winter. Normal litter size is two although a four to five has been quoted for populations in the Magallanes area. PREVIOUS GEOGRAPHICAL SPREAD The range formerly included the south of Argentina. It is uncertain whether the species still exists here. 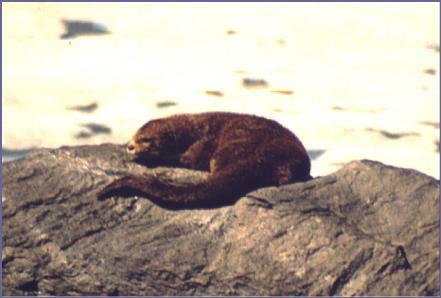 The Marine Otter is found throughout most of its original range, though at much reduced population densities. REASONS FOR DECLINE Hunting for pelts. CURRENT THREATS The Marine Otter is still poached for its pelt in Chile and Peru. The IUCN/SSC Otter Specialist Group state that marine otters are threatened by: pollution of nearshore areas with heavy metals and other contaminants, intense harvesting of littoral and sublittoral seaweed especially kelps which may reduce productivity and abundance of shellfish, over exploitation by fishermen of nearshore shellfish and fishes, killing by fishermen who see the Marine Otter as a competitor for fish and shellfish stocks, fishing techniques that result in the accidental capture and drowning of otters in nets (Foster-Turley, et al., 1990). The Marine Otter is included in the 1994 IUCN Red List of Threatened Animals as Vulnerable. CONSERVATION PROJECTS Marine Otters are protected in all of the range states. 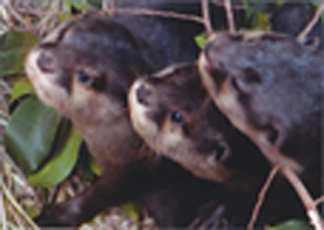 The IUCN/SSC Otter Specialist Group suggest the following actions: monitoring otter populations and supporting research, studying the impacts of harvesting kelps and shellfish, researching the natural history of the species, producing teaching materials for schools, surveying the islands and canals of the southern Pacific, examining trade routes of illegally obtained furs and greater enforcement coexisting legislation, and establishing parks and reserves in northern and central Chile (Foster-Turley, et al., 1990). The National Committee for Protection of the Fauna and Flora (CODEFF), Chile, is trying to acquire land for the protection of Marine Otter populations (Medina, 1994). SPECIAL FEATURES This is a poorly known species, for which the habitat and conservation requirements are not fully known. Foster Turley, P., Macdonald, S. & Mason, C. (eds). 1990. Otters An Action Plan for their Conservation. IUCN, Gland. 126 pp. Medina, G. 1994. Marine Otters (Lutris felina) need help. IUCN Otter Specialist Group Bulletin. 10. pp 6-. Reeves, R.R., Stewart, B.S. & Leatherwood, S. 1992. The Sierra Club Handbook of Seals and Sirenians. Sierra Club Books, San Francisco. 359 pp.